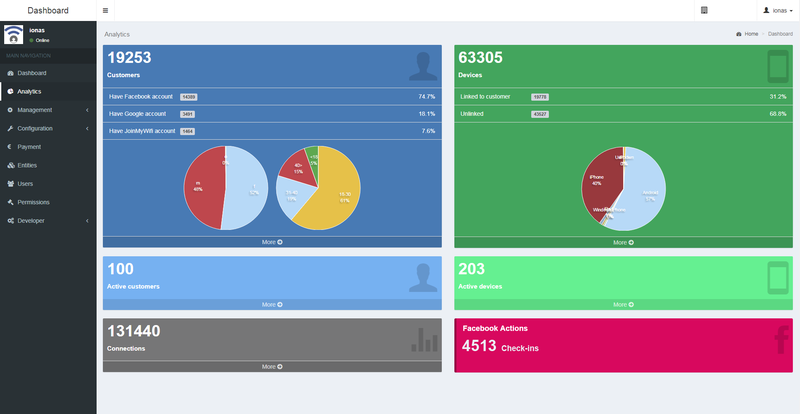 JoinMyWifi marketing platform provides usage analytics, demographics and customer information via a web dashboard. From inside the web dashboard each business can manage all aspects of configuration. Login to web dashboard can be done using username & password via any desktop computer or mobile device that is connected to the internet. Below you can see the analytics overview. On the upper right corner you can see the amount of unique customers assuming that each customer is using one device. On the upper left you can see the amount of customer profiles that were retrieved. These profiles contain information for each customer. Demographics regarding age and gender are displayed as well. On the bottom you can see the amount of connections and check-ins via the platform and also the number of active (live) users. Your business we'll be able to see all sorts of data about their clientele including contact info, demographic information, social profiles and so on.